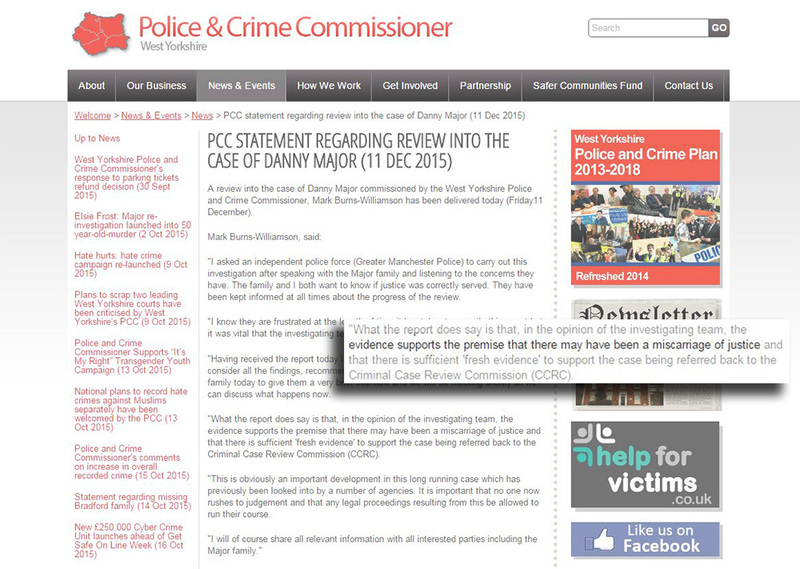 STATEMENT REGARDING REVIEW INTO THE CASE OF DANNY MAJOR (11 DEC 2015) from the Office of the Police and Crime Commissioner for West Yorkshire. A review into the case of Danny Major commissioned by the West Yorkshire Police and Crime Commissioner, Mark Burns-Williamson has been delivered today (Friday 11 December). “I asked an independent police force (Greater Manchester Police) to carry out this investigation after speaking with the Major family and listening to the concerns they have. The family and I both want to know if justice was correctly served. They have been kept informed at all times about the progress of the review. “I know they are frustrated at the length of time it has taken to compile this report but it was vital that the investigating team left no stone un-turned. “Having received the report today I must now spend some time to review it in full and consider all the findings, recommendations and next steps. I have spoken to the family today to give them a very brief overview and we will be meeting shortly so we can discuss what happens now. “What the report does say is that, in the opinion of the investigating team, the evidence supports the premise that there may have been a miscarriage of justice and that there is sufficient ‘fresh evidence’ to support the case being referred back to the Criminal Case Review Commission (CCRC). “This is obviously an important development in this long running case which has previously been looked into by a number of agencies. It is important that no one now rushes to judgement and that any legal proceedings resulting from this be allowed to run their course. Her Majesty’s Inspectorate of Constabulary (HMIC) is to appoint an independent force to scrutinise claims that the original investigation in Danny Major’s case was tainted and ended in an unsafe conviction. Mark Burns-Williamson, West Yorkshire’s Police and Crime Commissioner, referred the case after allegations that officers’ testimonies were unreliable and that key evidence, including CCTV footage, was withheld from the defence. Mr Burns-Williamson met the Major family this month before confirming that he would seek an independent review. Neil Wilby, a journalist who has campaigned for the conviction to be overturned, claimed that W Yorks police force was reluctant to investigate the case out of fear that “bad practice” would be exposed. “I believe the independent investigation will expose fundamental flaws,” he said.